Manny Pacquiao, if he ended his career Saturday night, did it on a high note. Looking excellent physically and like he was truly enjoying himself after a couple years of declining exuberance, Pacquiao again defeated rival Timothy Bradley, decisioning him and dropping him twice despite Bradley coming in with a solid game plan. It was a history-making night for him against one of the best fighters in the world, as he became the first fighter ever to win a true, lineal championship in five divisions, taking the welterweight crown. Pacquiao showed no signs of suffering ill effects from a shoulder injury; his speed was electric. It was probably the no. 1 factor Saturday in Pacquiao beating Bradley, and Bradley’s pretty damn fast. It was a boring fight to start, exactly what Bradley needed. With little to separate them early as they skirmished in inaccurate and/or cautious firefights, you could’ve scored it 4-0 either way or some combination. Bradley was better when he countered with a shot or two or stepped around Pacquiao after an attack and delivered his own; Pacquiao was better when he attacked more aggressively and forced Bradley to trade. But it shifted to Pacquiao’s side more definitively in the 7th when he scored a knockdown off a flurry. It was more a balance issue for Bradley than him being hurt, but a punch landed, Bradley slipped and he landed on his gloves. 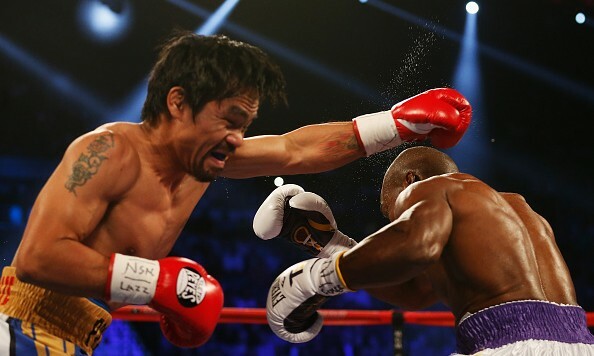 Bradley commendably rallied in the 8th, seeming to stun Pacquiao with his own salvo. That momentum ended in the 9th, when Pacquiao distinctly stiffened Bradley via a hard left, then caught Bradley with an uppercut as he tried to get out of harm’s way. This time, Bradley was hurt. It was clear Bradley was hopelessly discouraged thereafter. His body language was bad; trainer Teddy Atlas, who had given Bradley a solid fight blueprint — Bradley would’ve beaten most anybody else Saturday — and had shown the ability to motivate him against Brandon Rios, couldn’t get Bradley out of his funk. He lost all of the remaining rounds, although he gave it a go to KO Pacquiao in the final round, even getting rough by holding him and hitting him. Pacquiao, who tends to coast when the fight’s in the bag, took umbrage and punished Bradley for his misdeeds. It was good to see Pacquiao animated again, smacking his gloves together, bouncing all over the place. The Pacquiao-Bradley trilogy was far from one of boxing’s best, and we might not even have gotten the second if the first hadn’t been scored so badly. The third was unnecessary, too, but at least it was about half a good fight featuring the two best welterweights in the world and two top-5 pound-for-pound boxers. It also got Pacquiao back in the win column for what might be his final fight, rather than ending his career following a disappointing showing against the other best fighter of his generation, Floyd Mayweather (who does seem all the greater for how he handled Pacquiao compared to how a merely excellent Bradley struggled). We’ve already talked about what Pacquiao’s legacy will be if he leaves the sport after Saturday to focus exclusively on his political career in the Philippines. If he stays? Even at 37, it’s feasible to imagine this version of him beating Terence Crawford, where once it seemed only like promoter Top Rank sacrificing the old to the new. Trainer Freddie Roach’s idea of Pacquiao facing Canelo Alvarez then Mayweather again also somehow doesn’t sound so ridiculous. For now, it’s academic. Today, we can revel in another top win from one of the best fighters of our lives, and let the question marks linger for another day.